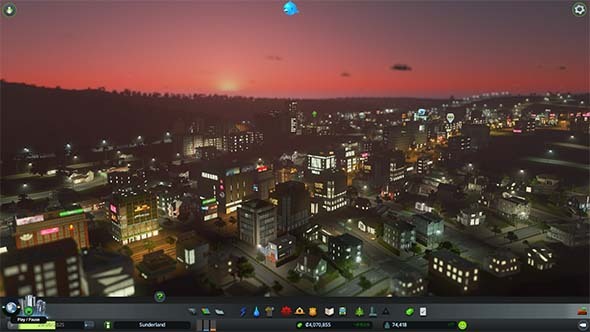 I've been playing the somewhat-underwhelming After Dark expansion for Cities: Skylines. I love Skylines, but there are a lot of elements of the game that I wish would change, and a few things that I would like to see added. I hope (and expect) that Colossal Order will continue to support the game for many years to come with new DLC and expansions, and this blog will outline some of the features, mechanics, and items that I would like to see changed or added to the game. It should go without saying that, since this is a PC game (with a built-in asset creator), many (if not all) of the following suggestions might already be implemented in one or more mods. I haven't played much with mods in this game yet, so I don't know what might be available. In any case, there's no reason why ideas already implemented in mods can't also be turned into formal game systems by the developers. Zone a coastal area as "public beach"
As much as I love Cities: Skylines, and as much as I think it blows the SimCity reboot out of the water, there is one mechanic of SimCity that I absolutely love, and that occasionally makes me want to go back to SimCity: building upgrades. It's a bit ironic that SimCity, with its ridiculously limited city size, is the game that allows you to add additional components to existing buildings that makes them take up more physical space; yet, Skylines, with its expandable city plots, uses only prefab buildings of set sizes. So the game that puts a premium on real estate availability encourages you to leave empty space around certain buildings. I guess it makes sense. SimCity's limited size means you can't afford to build whole new buildings and must make due with what you have. Skylines allows you much more space to just keep copy-pasting the same schools and garbage dumps every few blocks. Specialize your Skylines city for After Dark. Or don't. It's up to you. It's been a very long time since I've had a city-building game that I really enjoy. So it was a real treat to find Cities: Skylines last year. It was the first game to really capture the magic of the classic SimCity games and make them work in full 3-D, and managed to achieve the goal of abstract population agency that the SimCity reboot failed so horribly at. But as much as I loved Skylines, I was also very aware of many of its limitations. It didn't have as much content as you might expect from a game coming from a larger publisher (like EA), and there were certain elements of its abstraction that felt a little shallow or weird. The game's first expansion, After Dark, tries to address these limitations, but it doesn't really succeed. First and foremost, I have to clarify exactly what the expansion encompasses, since Colossal Order has created a bit of confusion on this topic. They launched a free update for the base Cities: Skylines game in parallel with the release of the After Dark expansion. This update included some of the core feature upgrades that the expansion's content depended on. Most notably, a day/night cycle, new zoned buildings, and upgraded crime systems. If you have Cities: Skylines, then you get these features as a free patch, and have probably been playing with them for months. The day/night cycle is a free upgrade to the core game, but makes the core game feel somewhat incomplete. While I applaud Colossal Order for the good will they foster by being willing to give away new functionality for free, this does kind of put players of the vanilla game in a strange situation. You get some of the new features, but not any of the ploppable buildings or city policy options that make them work. You get more crime, but not the prisons in which to lock up and rehabilitate criminals. You get the day/night cycle, but not the fancy new leisure and tourism zones that make nighttime mechanically relevant. In some ways, it takes the core game that felt very complete on its own, and suddenly makes it feel incomplete in subtle ways. Fortunately, the menu gives you the option to turn the day/night cycle off, which helps to preserve the integrity of the original game. But then you don't get the new feature. The update won't harm any of your existing save files though - with one major exception. 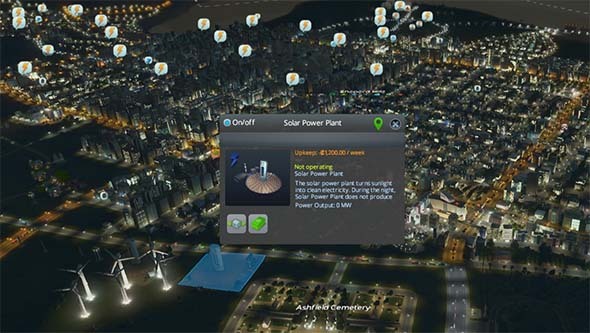 If you made the unfortunate mistake of creating a city that was completely dependent on solar power, then the day/night cycle will screw that city over big time! In the core game, this was actually the most optimal way to go. Solar didn't pollute, wasn't dependent on depleting resources, and money was easy enough to make that the cost wasn't a big enough deterrent to using solar. But with the day/night update, once the sun goes down, all those fancy, expensive solar panels completely stop working! This can lead to your entire city going into a blackout as soon as you boot up your save file. Suddenly, not only is solar non-optimal, but it's practically useless since it doesn't work for half the game. And this isn't something that you can fix by just increasing solar power funding or building more plants; the power output drops to zero! Solar power plants stop working completely during the night, leading to massive blackouts. Since I have some extra time off for this holiday season, I'm trying to go through some of my backlog of shorter indie Steam games in between bouts of Cities: Skylines and Beyond Earth: Rising Tide. One such game is Facepalm Games' 2013's sci-fi indie hit, The Swapper, which I picked up in a Steam sale like a year ago. The game has also been ported to many consoles, including the PS3, PS4, Vita, XBox One, and Wii U, and the ports were developed by Curve Digital. The Swapper seems to owe a lot to Valve's mega-hit Portal. Both games' central mechanics revolve around the player character using a futuristic non-weaponized gun (with 2 settings) to solve platforming puzzles and explore an environment. 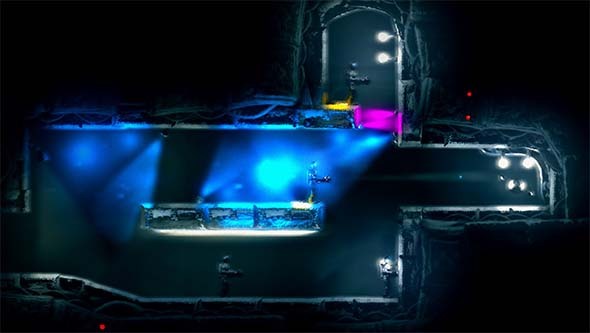 Portal is in full 3-D, whereas The Swapper is a more traditional 2-D side-scroller. The bigger difference however, is that the gun of The Swapper doesn't fire portable wormholes; instead, it allows the player character to instantly create clones of herself, and to swap her consciousness into one of the clones. Once created, these copies move in tandem with the copy that is currently being controlled by the player. The key to the puzzles is to maneuver yourself so that your clones can reach otherwise inaccessible areas or activate switches. All your clones move in synchronization, making relative spacing very important for solving puzzles. The space station is laid out in an unbelievable, but serviceable, series of puzzle rooms joined together by modest platforming sections. At first, the platforming between puzzles is interesting because it kept me thinking along the lines of solving puzzles rather than just moving from place to place. But there's a lot of exploration and backtracking, and having to navigate the corridors between puzzle rooms quickly became tedious once using the swapper gun became second nature and automatic. Fortunately, the game provides handy teleporters to allow you to quickly move to key sections of the station, so the backtracking never became as problematic as it could have been. 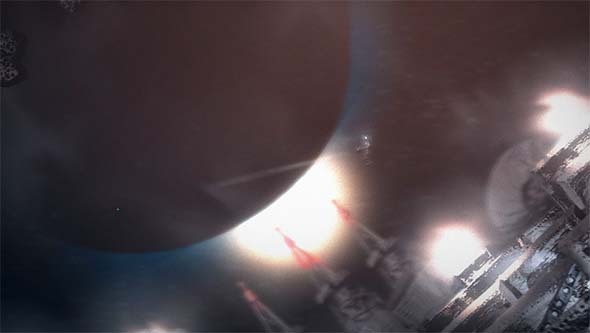 The puzzles themselves start off fairly simple, requiring that the player simply point the gun and clone herself in order to reach a platform or cross a gap and collect alien orbs that you use to unlock new areas of the space station. The challenge quickly escalates. 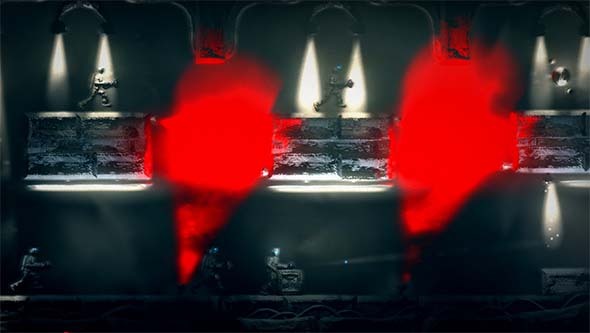 Soon, obstacles start getting thrown at you, such as colored lights that prevent certain operations of the swapper gun, forcing you to have to find more elaborate ways around the lights in order to reach your destination. You have to start using careful positioning, choreographed movement, gravity, momentum, and inertia in order to successfully solve the puzzles. And all this escalation seems to happen naturally based on the increasing complexity of the levels, rather than through the introduction of new mechanics or controls. About an hour into the game, I ran into a puzzle that took almost an hour of trial-and-error for me to solve. About an hour into the game, the difficulty suddenly spiked, and I ran into one puzzle in particular that took me quite a while to figure out. I even had to leave it and come back to it later with a fresh perspective. I thought maybe I was missing some kind of upgrade or needed to learn some technique that the game hadn't tutorialized yet, but that wasn't the case. Eventually, I figured it out, and the solution seemed head-smacking obvious, but I probably spent a good hour on that one puzzle (approximately half of my time with the game, up to that point). There are also some other sci-fi mechanics such as the occasional zero-g spacewalk, gravity inversion (allowing you to "fall" up and walk on the ceilings), and so on. These all flow fairly seamlessly into the game; although, I did feel that the gravity inversion felt a little unnecessary when it was introduced. After all, the game teaches you fairly early how to use the swapper gun to effectively fly by repeatedly swapping to clones created above you. This "flying", is, however, limited by the number of clones that you can create, and it's still subject to being blocked by colored lights. So gravity inversion felt superficial when introduced as a means of navigating the station. Once the gravity inversion was introduced into the puzzles, though, I recognized its value. You'll also perform the occasional zero-G spacewalk or invert gravity. I wanted a good showcase of what the PS4 is capable of compared to high-end PCs. Previews talked up the large, dynamic world, in which your decisions supposedly have major consequences. 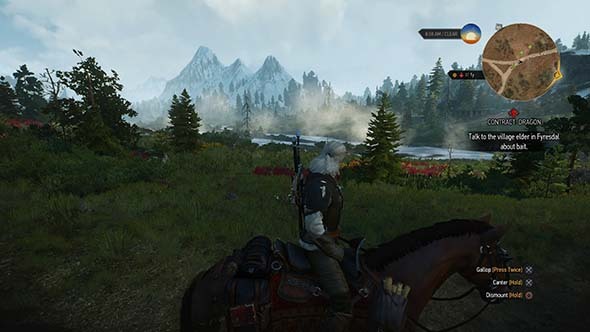 Oh boy, The Witcher 3 did not make a good first impression with me! I started the game on the hard difficulty. I had just come off of Bloodborne, so I was in a mindset to be challenged. My first two reactions to the game were fairly negative. Load times seemed long, but then again, the world is supposed to be open and seamless, so loading shouldn't be a frequent necessity. I also had some comfort issues with the controls in the tutorial. I dismissed them as a result of my unfamiliarity with the game and assumed I would get used to it. The biggest problem was trying to figure out how to reliably heal. I kept losing vitality in small skirmishes, and it just wouldn't recharge. I kept running out of potions, and the game wouldn't let me make more. I had to throw away the empty potion bottle in order to craft more of the healing potions. I assumed this was a glitch. Does the game require absolute perfection from the player? If so, I wasn't sure if I could handle it. The combat controls are sketchy to say the least. As I got into the game proper, the nagging discomfort that I felt in the tutorial was only amplified as the game threw more enemies at me. 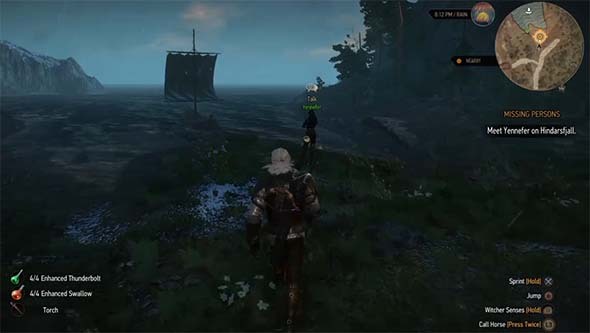 Even Geralt's "fast attacks" are lumbering compared to most enemies, and he is fidgety in his movement. Enemies are swift and relentless. It was hard to find an opening for my own attacks without taking damage, and my finger started getting tired from holding down the block command that only sometimes worked. The dodge commands also seemed unreliable, the camera never seemed to focus where I wanted it, and the target lock was nigh useless. It didn't help that the spell and accessory wheel is cumbersome to use. the meditate feature, and didn't have any healing items (not that healing items do much). I eventually hit a brick wall in which all the attrition set in. The sloppy combat mechanics constantly sapped my vitality, and I gradually ran out of healing items which the game was unwilling to provide more of. I ended up in a boss fight with literally half my health gone and no healing items left. 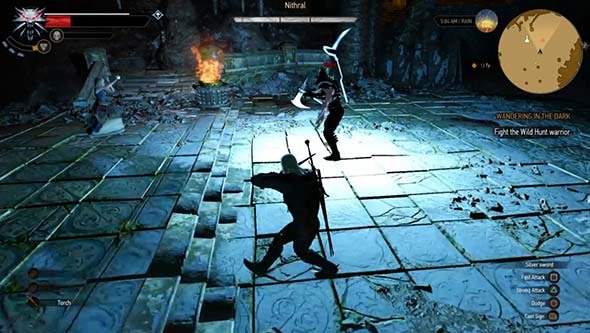 My NPC companion spammed lightning spells at him, but these did no damage and only got him stuck in a corner so that I was unable to get behind him and actually attack. To make matters worse, my weapons started breaking, and I had no replacements, and only one repair tool. I tried lowering the difficulty, but it didn't help. It seemed to be a no-win scenario. I had to reload from an earlier save and tried some other quests to hopefully gain experience, levels, and supplies. I tried exploring the world to gain experience from random encounters, and I sometimes come across mobs of monsters and try to draw the sword and start blocking as I approach. Instead, I go into Witcher sense mode, since witcher sense and block are the same buttons. 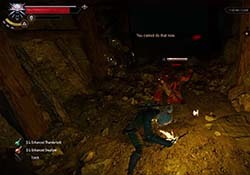 Often, the enemies get close enough to attack me before the game switches me from witcher sense mode to block mode, and so they get to leech some health away with free hits. This lead to some cheap deaths. leading to some cheap hits while exploring. I jumped between the quest menu and the map (because the map could only track a single active quest at a time) to try to find a quest in my level range that was nearby. I tried a missing person's case that lead to a warewolf den. The warewolf proved impossible for me to take on, since his health regened faster than I could cause damage. So much for that "doable" quest. I tried picking up the lowest-level monster contract available (a level 5 one), and died to some kind of porcupine alghoul enemy that damaged me everytime I attacked it. After a reload, I was able to beat it, and for some reason, it didn't damage me when I attacked anymore. Weird. What had I done differently? But my health was low, I was once again out of healing items, and I wasn't even halfway to earning my 5th level yet. The next set of bandits killed me. I was about ready to give up, as I was getting sick of staring at the long load screen every time I died and not having any sense of learning or improvement. I started squinting at the microscopic text of the menus to desperately find something to help me progress. It was then that I noticed the Meditation option in the menu. It was something that I had forgotten about all this time. I tried meditating for an hour thinking it might restore at least some of my hit points. I figured a full 6 or 8 hours would be required to fully heal. But, much to my surprise, that single hour fully restored my vitality. And it refilled my healing potions. Armed with restored health, some new weapons, and the knowledge that the constant war of attrition that I'd been fighting with the game was unnecessary, I pressed on, defeated the bandits, and managed victories against some other mobs of enemies in the overworld! Perhaps now I could finally start enjoying the game? Playing games like Skyrim, Grand Theft Auto, Assassin's Creed: Black Flag, The Witcher 3, Mad Max, Metal Gear Solid V, and other open-world games has made me increasingly weary of open-world gaming. Narrative-based, open world games like these suffer from a problem that I have started calling "open world limbo" (or "open world purgatory"). This is a sort of paradoxical offshoot of the concept of ludonarrative dissonance. The game's open world "sandbox" design seems to directly conflict with the narrative that the game is trying to tell. It specifically refers to the conflict between the story and the game's open world, rather than a conflict between the game's story and any particular game system(s). Generally, this manifests as the game designers setting the stakes so high that the player should feel pressured to progress the narrative, but the game's open world design never follows through with any real consequences for not progressing. 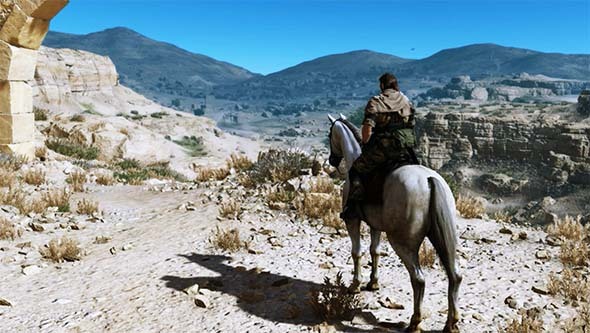 More and more big-budget games are going open world. is this a good thing? This leads to problems in which the player can spend hours, weeks, or months doing tangential, or completely unrelated, tasks and pushing the game's story objectives down to the bottom of their priority list. For people who just like to play the game, this may not be much of a problem. They get a massive sandbox in which to do anything they want. That is actually one of the back-of-the-box selling point for most of these games. But as one of those "games as art" kind of snobs, I also really like to have an engaging narrative that flows seamlessly with the gameplay. So if a game offers a narrative of any kind, you bet I'm going to judge the game based (at least in part) by how well that narrative works and how fully it is integrated into the core gameplay experience. And when a game tries to convince the player that they are destined to save the world from impending doom (as is often the case with big-budget, open world games), then I get really peeved when I find myself able to completely eschew that destiny in favor of picking flowers and peddling salvaged bandit armor for the next 100 hours. The source of most of the "limbo" comes down to the fact that these games' worlds (despite being big and detailed) often feel static and devoid of life. They don't change on their own. No one seems to have any sense of agency, and nothing ever happens unless the player is there to make it happen. Quest-givers sit around outside their house forever waiting for the player to come along and help them kill the wolves that are attacking their livestock, or find their missing heirloom, or deliver their special package to someone in the next town over, or whatever else they want done. The situation never resolves itself, the quest-giver never gets tired of waiting for you and hires another adventurer, those wolves never manage to eat all the remaining livestock, the heirloom never shows up in lost-and-found, and the statute of limitations on that package never expires. Emergencies can always wait [indefinitely] for the player to resolve them. Quest-givers will wait forever for the player character to show up and solve their problems.